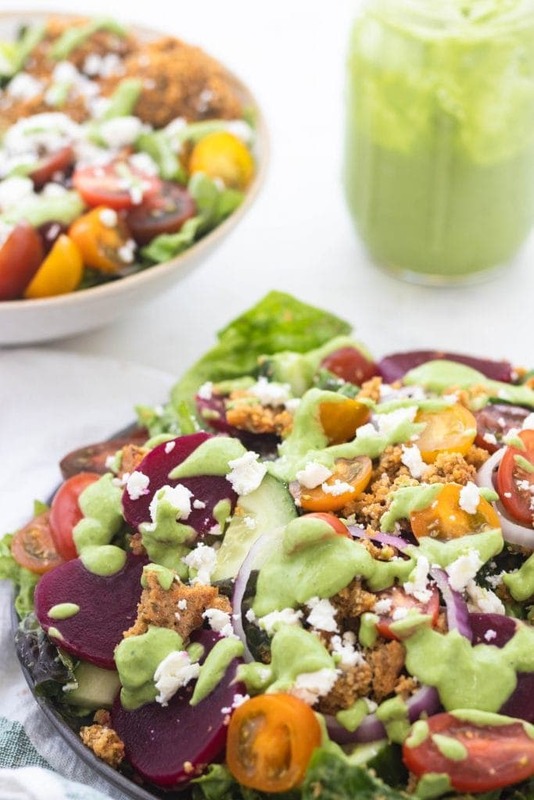 This Green Goddess Greek Power Salad Bowl is saucy, vibrant and zinging with flavor. A filling vegetarian lunch made in under 30 minutes for 4 servings. Phew, the midwest is through the polar vortex. It feels good to walk outside and take Breslin to the park again. I think we were all going a little stir crazy in the house for the past three days. 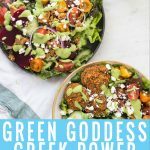 I made this Green Goddess Greek Power Bowl to help me get through the winter blues. Sometimes even looking at colorful food can improve my mood. Anyone else relate? 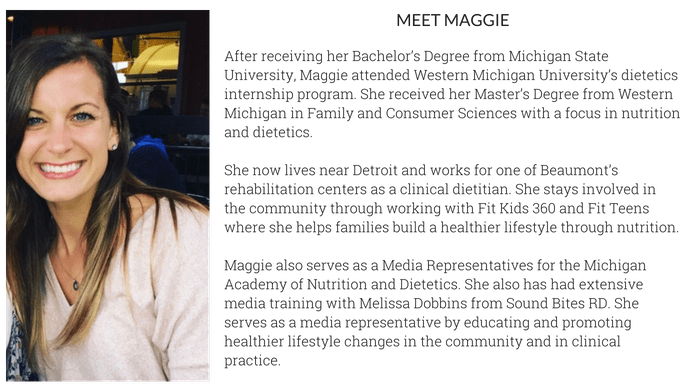 On a side note, one of my New Year’s resolutions for this year was to let you guys get to know me a little bit more. 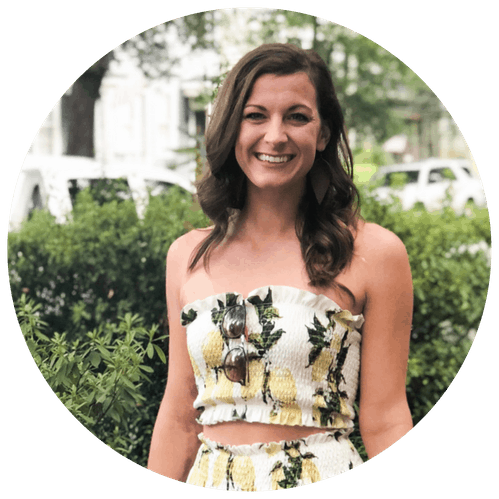 I am not the strongest writer and, frankly, I think you would prefer to read about the recipes on my site, so I’ll keep personal life on my blog to a minimum and save most of the personal stuff for instagram. 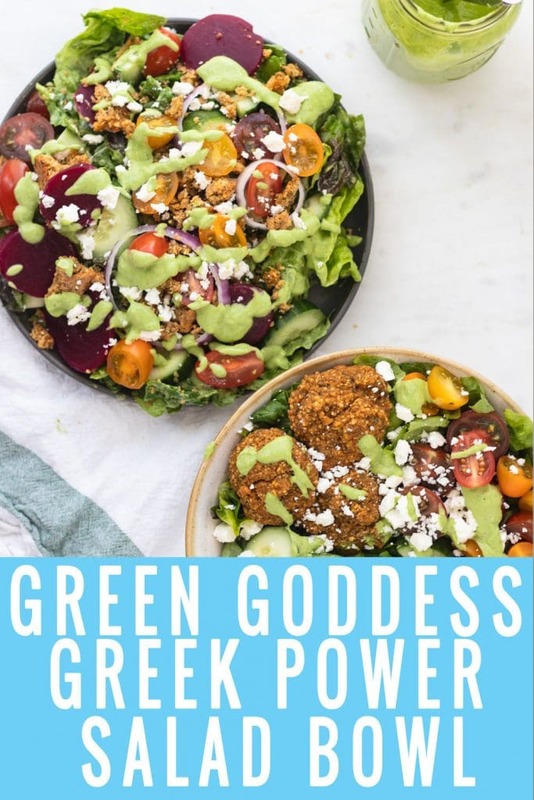 Let’s talk more about this Green Goddess Greek Power Salad Bowl. You’re probably thinking, why is it called a power salad bowl? 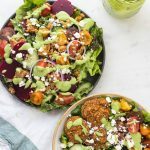 Well this Green Goddess Greek Power Salad Bowl is loaded with fiber, antioxidants, potassium, magnesium, vitamin K, plant protein and zinging with flavor! I’m telling you, you will feel invincible after eating this salad. Like having the energy to re-organize your linen closet invincible. 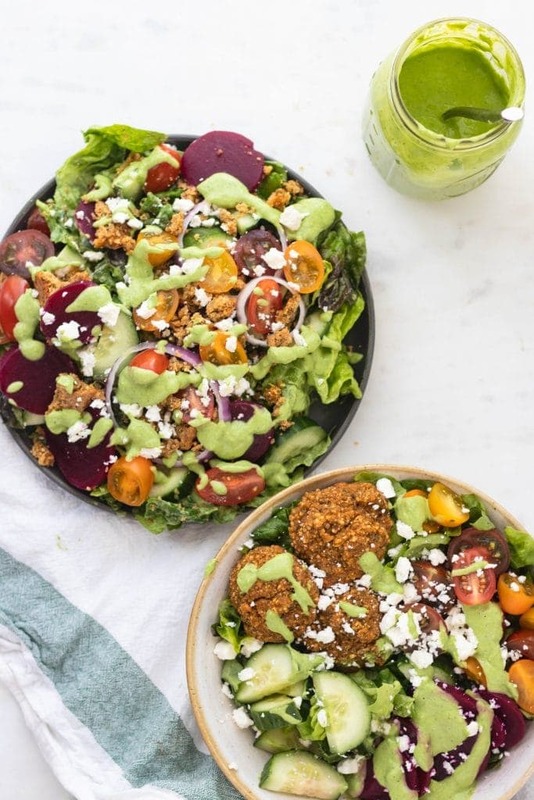 Falafel: While I LOVE this recipe, if you want to do the store bought kind and save time (no one is judging) then I love Traders Joe’s or Kroger brand. Gluten free options available. I bake my falafels in the oven to cut back on the trans/saturated fats from frying. All the vegetables: Beets, cucumber, tomatoes and red onion. All the players in a typical greek salad. I always use canned beets to save on time. 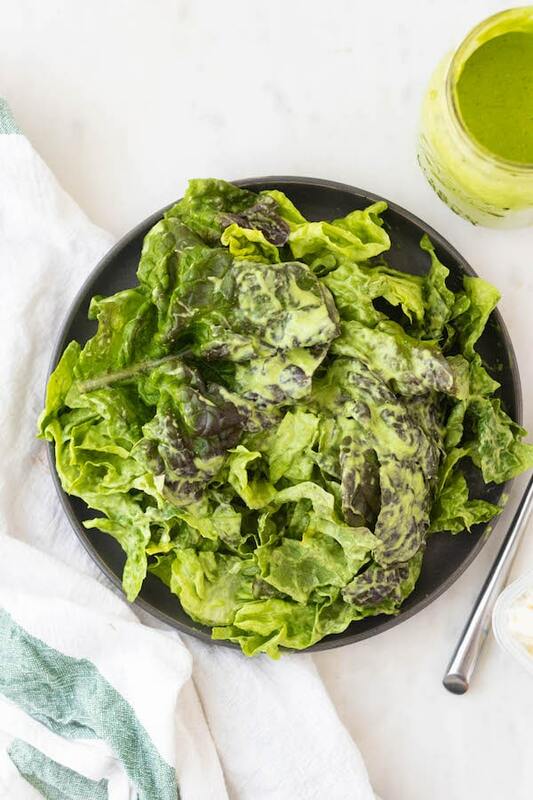 Butter, Romaine or Bibb Lettuce: All three are great greens to use in this power salad bowl. The green goddess dressing coats it so well and it really stands up against the other ingredients. I would suggest adding the Avocado Green Goddess Dressing just prior to eating or else it will soften the falafel. While falafel is baking, cut up and prep the rest of the salad. For easier prep, place four Tupperware bowls on counter and fill evenly with ingredients. Once falafel is finished, place 3 falafel in each salad. Drizzle with Avocado Green Goddess Dressing prior to eating. Falafels: As I said earlier, I like Trader Joe’s brand and this recipe. I always bake my falafel instead of fry. If you do not like falafel, other plant based protein options could be lentils, chickpeas or quiona. Non-plant based, try chicken, turkey or eggs.